Bob Harper is an idol and icon in the health and fitness industry. So when he recently had a sudden heart attack, there was a lot of head scratching going on. When a healthy person has a heart attack, it should be a wake up call to everyone. Especially to those of us who live a healthy and active life in hopes of extending it. The words healthy person and heart attack don’t seem to belong in the same sentence. But sadly they can, and in the case of Bob Harper, they do. How can a heart attack happen in a healthy person? Genetics. 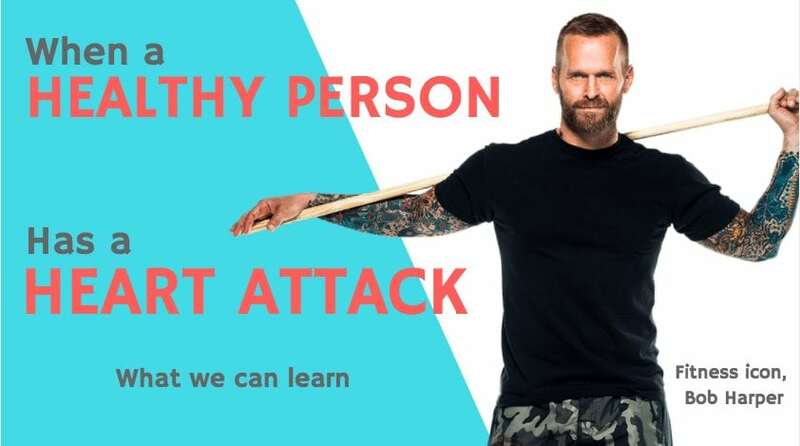 Bob Harper’s mother died of a heart attack and that kind of family history can increase risk, according to the American Heart Association. His heart attack is blaring reminder of the importance of learning your risk. Learn about your family history and genetic make up. Find out your blood pressure numbers. Understand what your cholesterol levels are. And check them all regularly. It’s true; nothing in life is 100%. You could do everything right and still run into trouble. While it’s impossible to diet and exercise away your genetic makeup, the good news is that the odds will be in your favor if you stay active and eat a healthy, balanced diet. Bob’s heart attack hit close to home. It was a wake up call to the reality of what can happen when there is heart disease in your family. He and I are a lot alike. Health and wellness are a way of life for us; its how we earn a living. We help people get fit and lose weight. We are the same age. We workout, eat clean, get enough sleep, drink a lot of water and enjoy life. He is a trainer on The Biggest Loser and I was a finalist to replace Jillian Michaels. But more importantly, we also both have a family history of heart disease and have each even discussed it on national television with Dr. Oz. I appeared on The Dr. Oz show for a health and fitness segment on genetic testing. I was plugged in for a stress test on national TV, being monitored by South Beach Diet creator and cardiologist Dr. Arthur Agatston. Running on a treadmill; my heart rate was blasted in neon lights for the entire world to see. 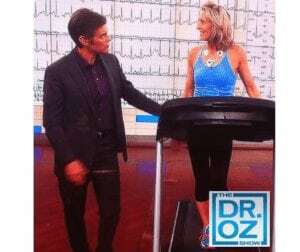 As Dr. Oz approached the treadmill to share the results on camera, he asked that I stop the treadmill. What I shockingly learned (and grateful I was straddling the belt and on solid ground!) was that I am 3 times more likely than the average person to have a heart attack. While I knew there was heart disease in my family, I was really shocked. And scared. I was certain my healthy lifestyle gave me an added edge. What in the world more could be done to decrease that? Dr. Oz assured me I was doing everything right and to not change a thing. If I weren’t exercising and eating right, there would be concern. Sadly, you can’t change your genes and family history. I went home thinking to myself…yeah, yeah, yeah whatever. I’m healthy, strong and fit. The likely hood of a heart attack happening is close to none. 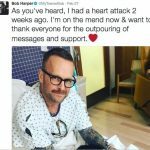 Until I heard Bob Harper had a heart attack. 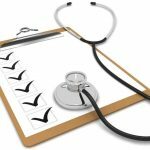 Could my name be attached to an article: When a Healthy Person Has a Heart Attack? Possibly. There are a few lessons to be learned here. First, appearances can be deceiving. A fit, strong body is not always indicative of what is on the inside. Secondly, If there is a history of heart disease in your family, a heart attack can happen to you too, no matter how healthy you are. But the healthier you are, your risk is minimized. None of us know what is in store every morning our feet hit the floor, so I encourage you to eat healthy and stay active. But most of all, be grateful, love hard, smile often, live your truth and that heart of yours? Open it as wide as you can for all the world to see. But before all that, PLEASE visit your Dr. and learn your blood pressure and cholesterol numbers and most importantly, your family history. I am still wondering why it happened to me on October 8th 2016. It is not genetic, my cholesterol numbers and blood pressur were/are good, I was running 10k every other day and had a rather balanced diet. But even then I had a heart attack and cardiac arrest due to arterioclerosis. The reason I am still here is that it happened on a soccer pitch where they have an AED and where 2 persons exactly knew what to do and how to handle. The ambulance raced me to the nearest hospital in Amsterdam where they put a coronary stent in me. It happened 6 months ago and I am still asking myself: How and why!? The doctor said that it was pure bad luck…..
Hi Hana, Im sorry to hear you experienced a heart attack but so glad there was and AED and speedy assistance to get you to the hospital. I don’t have enough information about you to give a clear answer, but I would assume you have a full blood panel taken to learn of other numbers that may give some insight. After writing the article, I have heard from a number of people that have experienced the same thing and others who suggest positivity, stress and anxiety can contribute . I do not confirm any of those as I am not a doctor, nor do I suggest you are a negative and anxious person, just wanted to share what I have hear. I’m glad you are ok and while Im sure it’s not easy to live with the notion it can happen again, I hope you continue to do all the healthy things you have been and most importantly enjoying life. Hi Amie, everything has been checked and (physically) I am ok now. But mentally it sometimes is a challenge but I stay positive and keep on doing the things I did before the attack. My chances of another attack are as much as the next person but my advantage is that I am being monitored every 3 months. Thank you for your answer and I will stay positive. You never know when your time comes so I certainly am living life to the fullest and enjoying family and friends more than ever! !